Biker Force is the place to be if you want to take your Internet dating to another level and are interested in meeting new people that share your passion for the biker lifestyle. Writing our Biker Force review was a walk in the park, simply because the website is quite straightforward and easy to use. Biker Force is more than easy to navigate. You can see this just by looking at its design, which is quite simple, no flashiness and no imposing pop-ups that often ruin the user experience. 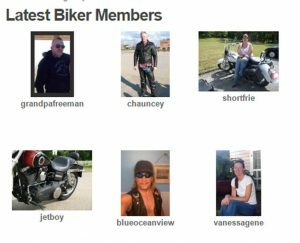 Even before you log in, you can see some pictures of single bikers available for chat, which is in itself encouraging and helps you realize that you can find interesting bikers that are quite close to you, no matter where you live in the US. One thing that is certain is that you won’t get confused when finding your way around this dating platform. Like its design, which is primarily black and white, everything here is pretty much spelled out for the users, all you have to do is create an account and start swimming in the biker dating waters. The functionality of this dating site is a good enough reason to sign up and try it out. While doing research for this Biker Force review, we came to the conclusion that it is incredibly simple not only to navigate your way through the site but also to create and maintain your profile. No matter what option you choose when it comes to your account, basic or premium, once you set up your user name (make it interesting) and password, you will be redirected to the home page of your account, where you can add photos, details about yourself and all those little facts that will make you more appealing to your fellow bikers. Like we mentioned earlier in this Biker Force review, as soon as you create your basic account, you can see your potential matches, who are both close and interested in the same things you like. You can easily browse through the matches, so don’t worry about finding someone to talk to. Also, right there on your home page, you will find the “Quick search” option that makes it easier for you to specify the age and gender of the person you are looking for, as well as the distance they should be from you. This is a very handy tool. Another great feature of this dating site is that all the profiles supply you with a significant amount of information about the person you are interested in. If you like what you see, you can choose to message them right there. You should also check out their “Looking for” section, where you can see what your potential match is looking for in a date. There is always the “Flirt” button that can help you make initial contact, which is especially useful if you feel like it might be too soon to start chatting. If you opt for the premium account, you will be able to send an unlimited number of messages and flirts, find out who’s looking at your profile and see full-size photographs of members you are interested in. With the premium option, your understanding of the website goes even further, but not only that – you will find out who is interested in you and how often they visit your profile. Biker Force is certainly one of the best biker dating sites, and make no mistake, you will always find someone here to at least chat with. There are more men than women on this site, but this can be compensated with the fact that Biker Force makes it easier for you to connect with singles close to you so that you don’t have to get into the whole long distance relationship shenanigans. You may even come across some members that are not exactly living the biker life, but are still very interested in it. All in all, Biker Force offers variety in its dating community, so don’t be afraid to explore it. Like you probably figured out from this Biker Force review, if you want to meet like-minded people from the biker community, then this website will help you get to know awesome biker individuals both all over the US and in your neighborhood.